The Top 500 Summits are the highest 500 mountains in Britain and Ireland with a drop of at least 500 feet on all sides. From the highest mountain on the list, Ben Nevis (4,411ft) to the lowest, Knockanaffrin in Ireland (2,477ft), this guide tells Barry's personal journey over all 500 summits. 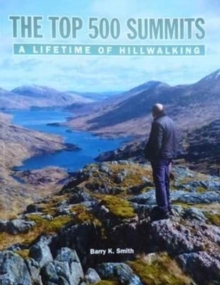 Other walkers who have shared in some of Barry's adventures contribute to this unique book.The 500 summits comprise 430 in Scotland, 29 in Ireland, 21in Wales and 20 in England. Anyone climbing all of them will almost certainly have completed the Scottish Munros and Corbetts. A record of anyone completing the 500 summits will be kept on the website where2walk.This book contains a fabulous collection of photographs. It will provide interesting and entertaining reading for regular hill walkers as well as the many thousands of people who go walking in the mountains of the British Isles on an occasional basis. Part coffee-table guidebook and part personal account, this is a book for anyone who loves the mountains of England, Ireland, Scotland and Wales.